For them it’s a protest, for us it’s a happy holiday that connects four day with Oct 2 as Mahatma Gandhi B'day. For me every day is like holiday that’s usual, it was my dad who gets four days + today (that he took for some personal work) = five days leave. I was expecting to ask him take me somewhere, a long ride on the car out of city. I have planed to watch some movie that I want, this week I watched two films Unnale Unnale and Karuppasami Kuthakaikara both has a decent script. Yesterday there was a large thunder storms like stopping the heart beat. 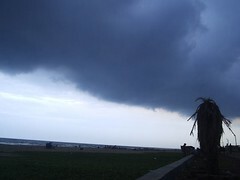 Most parts of the Chennai receive heavy rains and with hailstorm, how unlucky I couldn’t get the hailstorm in my area. Below is a very Cute song from Lesa lesa, from where I become a fan of Trisha. Hope you like too! No need an introduction for what is happening in India, what brought every political comments without leaving a day in the headlines news. This is one of an example that development destroys the nature in my view. The Seathusamudram project that connects the Gulf of Mannar with Palk Bay that provide direct sea-way through Indian territorial water from eastern to western coast without circumnavigate Sri Lanka to reach another side. I always look that politics should work apart from religious, rich, poor to support the need for people, not like using the religion for the political stand. 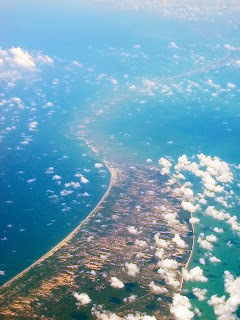 Let it be the Adam’s Bridge or Rama Setu (a chain of limestone shoals or 103 small patch reefs lying in a linear pattern with reef crest, sand clays and intermittent deep channels stretching for 48km and the depth varies from 3ft to 30ft between India and Srilankan water) which has varies believes that for hindu a land bridge built by Lord Rama to reach lanka to rescue wife sita from demon king ravana; Muslims belief of Adam, the first man used to reach Adam’s Peak in Sri Lanka where he left a giant footprint. Some Christians ascribe the footprint to St Thomas the apostle, while Buddhists assign it to the Buddha and some hindus in Lanka worship at as Lord Shiva’s and call the mountain Shivanolipatham malai. How many believes surround this bridge? Except from beliefs there were continues oppose from diplomatic assertions from Sri Lanka, apprehensive admonitions from environmentalists and fishermen’s, the project moved on to process in 2005 after years of discussion within governments, from where the idea comes from Commander Taylor of India marines in 1860. For over 3 years the dredging was going on and the project near the end (bridge) came the problem from a political party of a religion who brought ban in Supreme Court to prevent destruction of the Rama Bridge that it was built by Lord Rama. Now the Court has to play whether to proceed or stop the project itself. Could this project be useful or not, we loss the natural formation the coral reefs that prevent us from the tsunami hitting the coast faster and with great force and also destruction of traditional fishing grounds. There could be apprehensions on security, environment, resource exploitation… The safety of shipping and channel itself could be a major issue. There are chances, the Cyclones can take up the dredged sediments or an accident can block the channel for a long time in the chance of absence of quick clearing machineries. 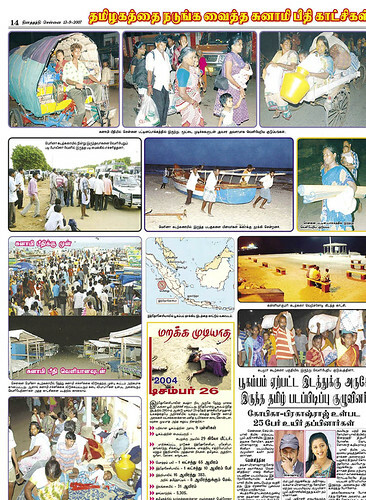 There is a good benefit for the Tuticorin-Colombo and secondary ports between Chennai-Nagappattinam. There was an expectation of employment for fishers and coastal people. The projection charges for piloting a ship through the channel may be Rs. 60 lack. The difference in money spent on fuel between the two routs is only Rs.7 lack and it also saves the distance and time of 254-424 nautical miles and 21-36 hours. The number of dredged channels are two of 89km with total length of 167km and proposed depth of 12 meters in a budget of Rs.2,427 crore. 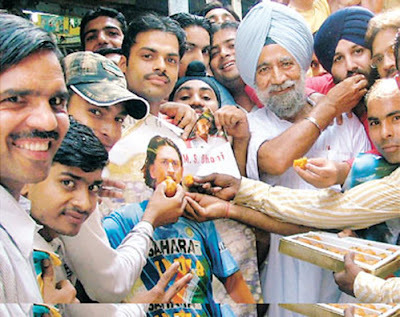 Those are the same people who slap him(Dhoni) when India loss in the real World Cup, now the same people feeding laddu (sweet) to his poster for wining the 20/20 world cup. What a great culture we have developed, whatever shameful we can do, done and then how can u people celebrate this win won my players? 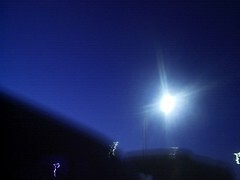 Will the players accept the happiness fully; won’t your act come to there mind? There is nothing to get anger for team getting out from the game, because it’s a game no loss or gain for you or me when they win or loss. No top senior players like Sachin, Ganguly, dravid… it’s a assert win from younger team mates. Wish this energy continues in upcoming matches, try the best team India. I don’t support those who looking forward for the India-Pakistan match in every series. Like how we see other countries, that’s how have to see the Pakistan too. The anger increases if India losses to Pak or Pak to India. I feel it’s wrong to bring the generation in a mood that Pakistan should be beaten always. We are looking when the two countries will move friendly and co-operate to peace in all critical areas. Then why the citizens create an enemy feel and frenzy on this partnership. The talented and energetic team will win, that’s not we are untalented, there will be rise and down in a game, so blaming others should be avoided. 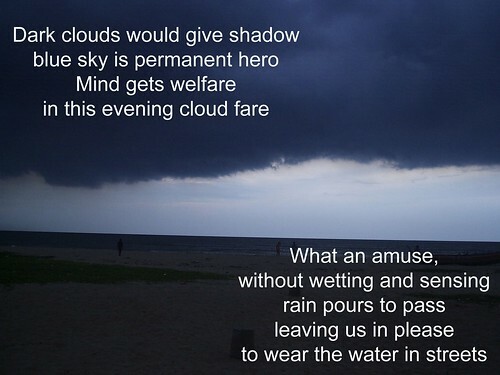 It should express out or not, but I want to tell the state of mind was in disturbed itself. I don’t know how to start of how truly I feeling and the thoughts come. Just thinking could this place can fill the hard words of mine, we need a gateway to exist and it was to be your mates shoulder it console more. Loneliness and helpless plays very important now and then, where I couldn’t expect above my parents. I really what to be a person who was trouble free for others, I try to understand the situation and forgive my wishes, craves ect... but I was struck by a question, for how long. It’s easy to tell to leave it and see your business, but for true love these words don’t comfort, it still looks over and over. I ask myself what credential I have to look for others, just having a quality of only human being that too not normal being, what would attract them to make share and also what they gain. My dears telling its bore to be with me, I want to know what are they telling me a bore person or in how I treat those bores. In which way I should satisfy them are they expecting, without knowing what to tell, than maintaining silence to save my courtesy. I always look for the holidays of my cousins where I come to free mind just only spending with them, playing, going out chatting… it hurts to hear them feeling bore to be here. Mind today thinks so much, and things changes times to time. I am in a situation of couldn't express my thoughts and disagree on what I feel in open mind. As I said above, the credential hesitates me here more, when trying to disclose my thoughts or an advice to any other in open. I was put in suffer more times when attempt tell something, if someone could comes in what you have the quality to comment. Whatever trouble it shoots, the creator never tries to break or throw the hard and energy he spends to create a thing. Like that my parents, they listen to whatever I throw in words if they like it or not, won’t stop or close the doors even though they don’t accept, but I can’t make the words die between us. So I like to express the same through others, but it was not even heard and instead it was tried to hide through there words. Time really matters more in my life nowadays. How it would be little drops for a monsoon would lack to support water, like that for the little work the time takes more. Particularly the half an hour work takes an hour or more for me to finish compare to a normal person. Just not to say, I experiencing it nowadays the more the hard I face with hands. I know the activities would be reducing to slow in everything that was the reason for the over time, and many complaints follow within the time taking to spent on routine activates and it also affect the blogging time too. I go through the despondent of my impossibility for every small loss and the disturb I have to make. I blow, blow and blow, in dark no one notices. It was torched in light here. If there was none to listen, I would be in mentally disorder, thanks you all for listening to what ever I tell. ## Current song from Tamil film May matham, Minnalea nee vandhadhaenadi... how beautiful the lines are, SPB`s voice touches the feel. After crossing the age of teen, students thinking themselves they are more matured to handle anything on their own. Because of this thought and activities how many problems they have to face and they also not even knowing how many are affecting by this. It’s good for them to handle any sort of fact if it was for good cause; but if they engaged with any problem with in themselves or with others; the peace process would never take place, instead of facing with anger. This is what something happening with some students and with institutes they study. It was not new for collages and institutions, that problems happening for years that involved by students, but a good solution to stop students making problems must be thought. I am only telling about some. Destroying the public and institution properties in the clashes between students and sometime even against the institute rules and officials is happening now and then. These happen in the anger and tell the students are young blood to get more anger on simple problem; why this happen when other like them are not behaving worst. When they enter some problem, they look for not forgive the self-esteem and strength before others and get sudden anger for everything, without knowing any indirect and direct affect that create. Are they behaving like educated young’s are the road side rowdies, even some rich and strong background student’s brought the rowdies in support for the fight. I want to know what the schools teach them for over ten years before they enter the collage, its not there response to build a good character in them. But see what they learn in school couldn’t help to face other problems than studies and on carrier. Parents are the souls disturbed mentally because of there children’s activities on their campus. Which parents would satisfy if there child was suspend or dismissed for wrong activities? and more the parents worries are on their future, but the child not think like them before involving. One of our known person’s child was involved in some clashes between students in collage and was in suspension for a month, but it seems he was not at all worried about that like their parents was undergoing. And it was like he was permitted to collage by paying fine for what he and other students make loss for the institute. Except these, when the collages are closed in the clash, the studies of others were disturbed, they loss the hours of class and the preparation for exams and lack for the notes by lectures. Parents and schools should teach students to use self control and self monitoring techniques to control there behavior. Developing the humankind in everyone, dismiss the injuring behavior from the mind and make them to walking towards peace process in every issue that would think to solve not to pull great. I come across these monkeys (pic) while browsing the net. Cute isn’t it! The national geography released an article of World's Top 10 Most Polluted Places. It includes India’s Sukinda. The home to one of the world's largest chromite mines used to make steel stainless, among other things and 2.6 million people, the waters of this valley contain carcinogenic hexavalent chromium compounds courtesy of 30 million tons of waste rock lining the Brahmani River. Ukraine’s Chernoby. The fallout from the world's worst nuclear power accident continues to accumulate, affecting as many as 5.5 million people and leading to a sharp rise in thyroid cancer. Russia’s Dzerzinsk. A center of Cold War chemical manufacturing, the city's 300,000 residents have one of the lowest life expectancies in the world thanks to waste injected directly into the ground. 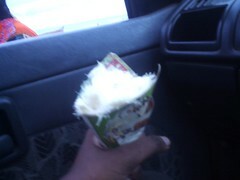 Zambia’s Kabwe. The second largest city in this southern African country was home to one of the world's largest lead smelters until 1987. As a result, the entire city is contaminated with the heavy metal, which can cause brain and nerve damage in children and fetuses. Peru’s La Oroya. Although this is one of the smallest communities on the list (population 35,000) it is also one of the most heavily polluted due to lead, copper and zinc mining by U.S.-based Doe Run mining company. China’s Linfen. A city in the heart of China's coal region in Shanxi Province, its three million inhabitants choke on dust and drink arsenic that leaches from the fossil fuel. Russia’s Norilsk. This city above the Arctic Circle contains the world's largest metal smelting complex and, therefore, some of the world's worst smog. "There is so much pollution going into the air from this place that there is no living piece of grass or shrub within 30 kilometers of the city. Writing is one important that changes our life. The satisfaction we get from writing on our hands and reading it, gives the interest has comes from my own experience. Mom used to tell I wrote alphabets and numbers before going to school, and after that is the papers next to slate and chalk that wishes to write more. It was the single, double and four ruler sheets for different subjects, particularly the four rulers used for English inspire me to write. There have the lines for small and capital letters, writing according to the rise and down of letter inside the lines taught me the easy way of writing. Actually my writing would be like scribbling, but it’s all the gentle goes to my tuition teacher who corrected me by holding my hands to give practice in join writing. It was the comfort I couldn’t get in school where we have to follow the teachers writing on the board in fast, but it was the scold I would get from her after returning to tuition with the scribbling notes. I could only realize it then and now the way I learn to write and spell the words from her. Today the world is changing towards computerization; every thing was done through pressing the keys. The more the writing we use only till our campus life, that too are changing to digital format now, where a laptop for student instead of notes and books. When their was emails, whom to write letters and post, too little are doing that. Even the message to know was typed through keys, not in pen; the only thing is signatures were done. The bundles of files and writing works in offices are doing through computers, where the writings are in folders in some corner of the hard disk. The laziness in writing discloses in today’s young’s, somewhere they expect the help from family members or known to do their works. What we write is nothing, the tool we use to write important. 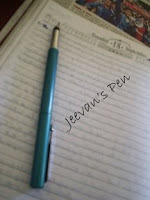 I am thankful to my school which was very strict in using ink pens (fountain pens) and the habit I still follow today. After the school life, I was in touch with writing even now I find time to write a page everyday. I feel that writing in hands does much, that more do the pen we use. Many of us may not realize the harm of using ballpoint pen, and the refill that used to write; nowadays the similar one to ballpoint was the Gel pen that was encouraged by some institutes. More over these pens are made of plastic that was harm to environment, ones the refill was finished we throw it and it wasn’t a recycling thing and the plastic releases poisonous fumes in the atmosphere that cause cancer when it was destroyed. In average the refill stands for a month and so according to the much we use, and then it was replaced by new one or by a new pen itself. With just 100 million people out of the 150 million uses plastic ballpoint, then we have something like a billion plastic pens and ten billion refills with one a month. An alternative to the ballpoint is the only fountain pen, because of taking time to filling inks often many of us avoid it, but it was the best pen for us and environment. The bottles that store the ink can be reusable, so use a fountain pen that was a perfect and for friendly writing and if you care for environment tell bye to ballpoint and go to fountain pens. The clay Ganesh was brought on the day before couple of hours to worship. The sundal, sugar pongal, vadai…. Were shown to him and ate by us. On any special day the entire time was before television with some nice and bored programs with all special foods as snacks to grind. It was the day for a new channel to enter the entertainment world for homemade, actually it’s a channel for Ads and remaining times for programs it seems. Ho I loss the endurance watching films on TV. Evening their were some drops, but it wouldn’t disturbed the ganesh procession from our street temple. Today the clay ganesh was immerse into the tub to dissolve, and then to pour at earth from the usual way of dissolving in sea. I think it would take some days to become dissolve fully. It was an expected day to meet one of my dear cousin bro, who comes in a short holiday from his hostel. We don’t know he was over worried of leaving all of us or any other reason for his leanness, I was kept holding his hand for sometime. There was the movie Periyar on Sunday in TV, one of the looked film to watch. I was to tell it was nice to know a great leader of India, his simplicity, thoughts, and the struggle put me on stand to think. It wonders to know he has some policy disliked with Mahatma Gandhi’s. His oppose on some blind beliefs on religious ceremonies, the attacks from the upper caste on his true statements and self respect for everyone were captured well in the film to how people could understand. Proud to have such leader for our country and felt to have none like him now. His decent way of approach on politics and keeping the private relation with them in lovable manner surprises. An admiring act by Sathyaraj as Periyar. Hope u all had a nice celebration too. Inimae Naangathan the very first 3D animation film in Tamil was released this Friday. A film with cheerful characters of four friends Vichu, Varathu, Vaithi, Govinth. It sounds different is it, we had animations film that was dubbed in Tamil, but which was fully created in Tamil is the first time. Film with a low budget of 35 million, was technically Directed by S. Venky Boboo, who himself wrote the story screenplay and produced by S. Sridevi. Voice for the characters is sure to make laugh, the comedians Pandu, M.S. Basker, Vasu Vikram… done a good job. Music my Maestro Illaiyaraaja, it was few months back I watched a review about Inimae Naangathan in SunTv on a special day. From that movement I was attracted by this film, and excite to know its release, the music was one I liken in the film. It has some sweet song Orumurai Kettalea... was fun listening and watching, Illaiyaraaja’s vocal surprise the song in the soft instruments. I was searching for its music, but couldn’t find… but the first line would always exist in me is the Vazvu Venduma va va…. the inspiring lyrics would really catch with young’s. I was wishing to watch this film soon. Here the trailer and a song of the Inimae Naangathan, enjoy. After the recent earthquake off Indonesia coast, the tsunami warning along the Indian coast was announced by govt. 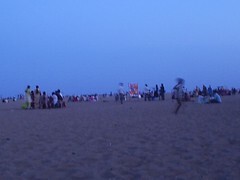 The residents near to sea were made shifted to safe places, police and other forces kept ready to tackle any situation. The drama of Tsunami end after 3 hours when the Indonesia withdraws the warning, but the fear continues in people where they kept themselves away from the shores and some spend the night at streets. Some scenes of Tsunami fear here. Two days left for the grand festival of India, Ganesh Chaturthi and wherever those worship lord Ganesh. It was Bal Gangadhar Tilak who brought nationalism with religious, it not only gathered people to celebrate the festival by keeping ganesh idols in public place, but also inspired for the freedom fights against British. In tradition it was celebrated individually by making a clay or mud ganesh idol and submerges it somewhere in lakes, ponds and oceans after ending the working. As we celebrate, its time to think about the damage we create for other lives that share our world. It would wish us to buy a colorful idol instead of the usual clay made that kept on our street sides and sculpture shops, but before going on we have to know the chemical paints that gives a beautiful look would mess our water bodies and environment when it was dipped . However some idols kept at the street corners and temples have been made of Plaster of Paris. It’s not a natural element that we get from… when it immerse it gradually increases the acid content of the water and if it’s a painted idols it release the lead, mercury what was harm to water livings. According to Wikipedia “the danger of this was illustrated in January 2007, when a sixteen year-old girl suffered third-degree burns after encasing her hands in plaster as part of a school art project in Lincolnshire, England. She subsequently had her thumbs and most of her fingers amputated.” To avoid the change and for a festival without harming any other we must follow the rule of sending the material from where it took. To avoid facing the challenges, it’s not wrong in changing our Patten. Simple solution that could be useful as well eco-friendly is recycling the same idols esp. made of plaster to the following years or give away the Idols to those who use for others festivals. It’s visible for years, few days along with Ganesh Chaturthi the shores of beaches and water bodies looks bad in conditions, were the remain things that couldn’t dissolve give way to shore. Another idea that present often is dip the clay idol in the water filled tub and pore in the earth where it belongs. Hope we all follow and would continues the process without any harm for our environment. I would tell it’s the mind that fails to work on what we are doing is right or wrong and the anger of someone is deceit by wrongfully. At that time, we won’t think of conscience and the aim only is on punishing him severely on the disappointment they experience from them. Not one or two somewhere, many to express the anger blindly, even the matter was small. Came across few people who can’t forgive the strike by a trickster and the words talks on them shows how the mind was developed into violence, even to kill if they found. Where we learn the punishment for wrong activities is doing the wrong thing again and more? Just beaten violently into injury could make the incident fine, would it satisfy the ones loss? Where could find the justice in something stolen, with no clue who was the burglar, but in doubt the one wander at the place was beaten bloodily. It was not a couple of week’s back a youth in Bhagalpur (Bihar) was beaten without humanity, tying his hands and legs for snatching a gold chain form a woman. It was the police who was watching the incident alive when the mob thrashes him and to his part of tying him at his motorcycle and pulled till he become unconscious. It has shaken every one of us and the incident still without leaving the mind; then again an incident at same district by mob is dark. When a three youth whom were snatching the motorcycle at gunpoint, where blinded by a group of relatives of the victim. The message flies through the mobile and the angered people dragged the stolen bike on the way from the youths and kick severely to pierce there eyes with a sharp tool ( NDTV, news). The scene wasn’t imaginable how they have agitated for the act; it includes a school student of 9th. It was only the police whom blindness happed sometimes in the same district in 80’s, now the people took that job. 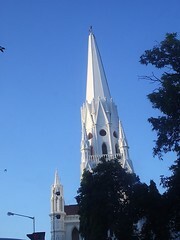 Santhome Basilica Cathedral is one I never forget to have a glance at its beautiful structure whenever I cross to visit Marina Beach. 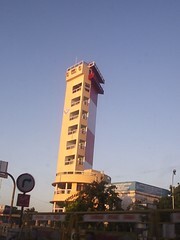 It’s everyone’s wish to watch Chennai from this Light House as I have. 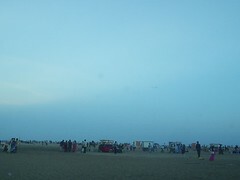 It located at the south end of the Marina beach and it also owns the meteorological department and it restricted to visitors. 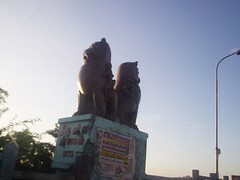 It’s the newly designed lions on the Thiru Vika Bridge, Adyar. Our Street Pilliyar (Ganesh). 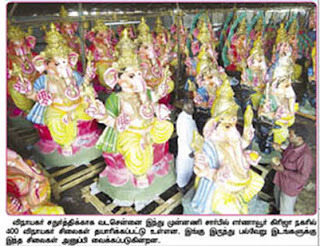 Its getting ready for Vinayagar Chaturthic. 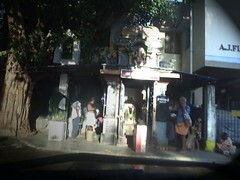 When I come across this temple in my evening rides, I could feel the cool breeze from the peepul tree it holds. Chennai was facing unusual changes these days may it be neither the rains nor the lack on garbage cleaning. People watched it differently when the modern technology was involved in cleaning garbage’s by a foreign company Onyx. We set free a sigh when the corporation agreed with privatization of 4 zones of Chennai to clear garbage, and it was relief from the year’s experience of opened Lorries used by corporation that carries the garbage from a place and spreads throughout the way it moves. Many of the times it gradually affects the traffic for minutes and with unclear. I should tell Onyx workers are friendly people to the society, they have care on their work. Without monotony and with endurance they pick every bit of rubbish that left on the streets into their mobile bin. The areas that have bins looked clear and only spills when it was overfill and the time it takes to clean the bin was just 2 minutes. These six years of Onyx’s work was ended in August and when it was time to look forward for another company to take over, then came the Neel Metal Fanalca Environment. We all expected something more than the past cleaner from Neel and it was like they have starting problem, so the outcome was the garbage stagnation at all zones. It was the situation that gone worst and the equipment where not available by Neel and the Onyxtook away the bins they placed, as soon the agreement was over. Then with the rise of complains of garbage stagnant for days, the corporation call back the Onyx to step to offer their equipments and vehicles to clear garbage till the Neel was comfort to offer their own. What to tell if rain join hands with garbage? The city muss. I heard still it lacks to clear the garbage and as it was raining there are chances for spread disease. The Neel that took away is now started to train its new workers for sweeping roads and cleaning garbage. There have 1,300 workers so far, and the company has decided to engage workers to improve retain. A question rises what’s the stage of ex-workers of Onyx who are already and going to expel from service? Would they been searching for another job or the new Neel will accept them to work within? News today read the ex-workers are ready to work for Neel, buy the salary was expected to be lower then earlier according to representatives. Now these lives are helpless for whom to contact, with the Neel or there old house Onyx. Another difficult has opened now was the suddenly opening of holes that were once opens for wiring on the roads and then tarred without filing it properly. As the rain water soak the earth, the roads pulls interior to make riders and pedestrians hard. 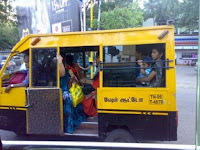 Share Auto... the familiar name of Chennai residents to move. 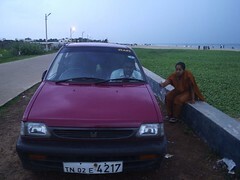 It was an auto that was shared with strangers who were to pass on the same way we go. These autos attracts the riders in cheap rate compared to yellow autos that charge high like the gold, must tell these autos make the travel easy than climbing the 2 foot height bus steps. But what a difficulty they give to others is the improper way of driving. They are not following the traffic rules, it will be the complain that all other riders would have on them, they never see who is coming on the side, they stop wherever they like, esp. on the move they suddenly comes to left to pick those standing for auto or just stop to ask any one is willing to take a ride, without care of other vehicle they are disturbing. 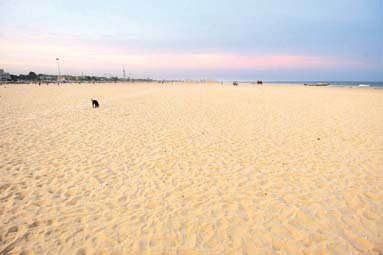 Being a Thiruvanmiyur resident we are experiencing that every time traveling on ECR for few km from the Thiruvanmiyur to VGP golden beach. The evening and night travel in city is worst that too in the raining times, rain water stays on the road and traffic on its peak to move vehicle inch by inch, where the relief... hum. Everywhere around the world we celebrate the teacher’s day at different days, though in India we celebrate the B’day of former president of India Dr Radhakrishnan(Sep 5.) and we have to thank for those who found this day for us to praise the teachers. Like a day dawns, our life dawns in schools and it’s the teachers who play a big part in our life to make us a capable person. 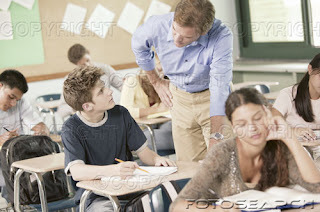 Every time students listen to teachers, but on this day students make teachers to listen for them. We all have been a student in our life for years and we have the most unforgettable memories in schools and with teachers. Those times it was the mood of playful and it was our teachers to make us concentrate on studies and it was not easy thing for them to do that. It was like 10 years of life with school for me, where I got many kind teachers whom cared and put support not only in studies and for other activities too. I have come across some teachers who were very strict and friendly; in one is my English teacher who always with smiling and it would be her class with noisy. Soon it will come to mind is sitting in the first row and it was a student who was doing silly activities at last bench and when she approach him to scold, he run around our desk and starts to play with her, for us it was fun to see them, even though she never used any harsh words or scold hardly on him, but finally the bell rings to save him. There was this math’s sir name Pichumani, he is the one where all fear, it was not him, actually his strong stick. It was in his class only many of us got punished severe in his stick and knee standing for not doing homework’s and missing the book at home, but he spent times for us to make clear the uncertainty. One person who always comes to mind is my Tamil sir, he only take Tamil so we doesn’t know his name than Tamil sir. He is such a kind teacher his class is please to listen and esp. for his thoughtful stories he shares in between lessons. He is best to encourage and blow hugs if there were something done by students, I have a feel that I miss his class now. Even after leaving the school, he did forget to wish and hug me when I met his outside the campus ones. I won’t think I have the deserve to advice the teachers all over there, but I could express my thoughts in this time. Glad I was not the last or first bench student, we know this term of back and front is just a distance than anything, but it can affect the students mind that teacher is not giving response for them. Why I said is I felt like this, when I was absence by some teachers when others were. So this space should be changed in a circulation of bring the first bench to back and back to front… An area that I feel still exist is the boys girls classification in practice at class. In the co-education schools, there is a thing that boys and girls won’t share with each others; the gender equation separates girls for a bench with no boys. What I think is the teachers could make sure the gender classification changes into a friendly manner. When this was being changed from the schools and in between students, it would really bring a change in our society. Teachers should not only motivate the talented and well studying students, they need to encourage the average and weak students for there every and even small steps. By threatening or showing hardness they only get anger on teachers, in affection and kindness we can make them enthusiastic on studies. Teachers can shape students as must not only concentrate on the carrier that improves their own life alone, they can make interest on the public services. When students were given only more important on subjects that helpful for their higher studies and towards carrier, they lack for moral support and some habits that muddle there mind without to take a steady decision on the life. Teachers can create best students and also best state of mind in them. # Current song is form film Minsara Kanavu, a soft melody. 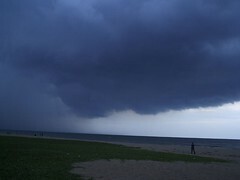 There were heavy clouds surrounded the shores of Bay of Bengal last evening. Some pics of them here.